(0 Customer Reviews) | Write Review 12 issues per year Franchising USA is a monthly consumer publication bringing you all the latest news, expert advice, and information from the world of franchising. Written with franchisees in mind, Franchising USA is a valuable read-before-you-buy resource for expert legal and financial advice, marketing and business information, as well as feature articles, and franchise profiles. Produced by CGB Publishing, a member of the IFA specializing in franchise publications, and with 30 years of experience in international publishing, Franchising USA is a must-have in your franchise research process. Franchising USA is a monthly consumer and trade publication bringing you all the latest news, expert advice, and information from the world of franchising. This issue features an in-depth look at health, wellness and fitness franchises, well also providing legal, financial, and business advice useful to any franchisee. Franchising USA is a monthly consumer publication bringing you all the latest news, expert advice, and information from the world of franchising. Written with franchisees in mind, Franchising USA is a valuable read-before-you-buy resource for expert legal and financial advice, marketing and business information, as well as feature articles, and franchise profiles. Produced by CGB Publishing, a member of the IFA specializing in franchise publications, and with 30 years of experience in international publishing, Franchising USA is a must-have in your franchise research process. You'll receive 12 issues during a 1 year Franchising USA magazine subscription. 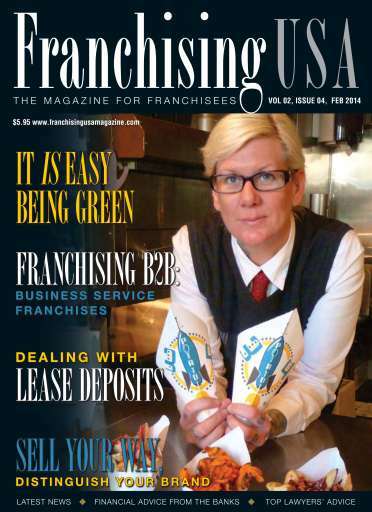 You'll receive 12 issues during a 1 year Franchising USA magazine print subscription.